The ADA has been the law of the land for nearly 30 years and the only “reform” it needs is significantly greater enforcement. Disabled people in 2018 still can’t count on something as basic as a toilet in public spaces. If you don’t think there’s a cumulative effect of never knowing where your next pee can actually take place, you try holding it through 30 years of work-related business trips, restaurant meals, and meetings. After 30 years as a proud, out disabled woman in the workforce, I wonder how many of us would be the bosses of today if the required schmoozing, travel, beverage-enjoying didn’t come with fear that we wouldn’t be able to #PeeToo. Work doesn’t happen just at work. If you want to be in a decision-making position, you have to “show initiative” and “develop relationships.” In other words: You have to spend time in public spaces. Places that may or may not elect to follow the law and provide an accessible bathroom. 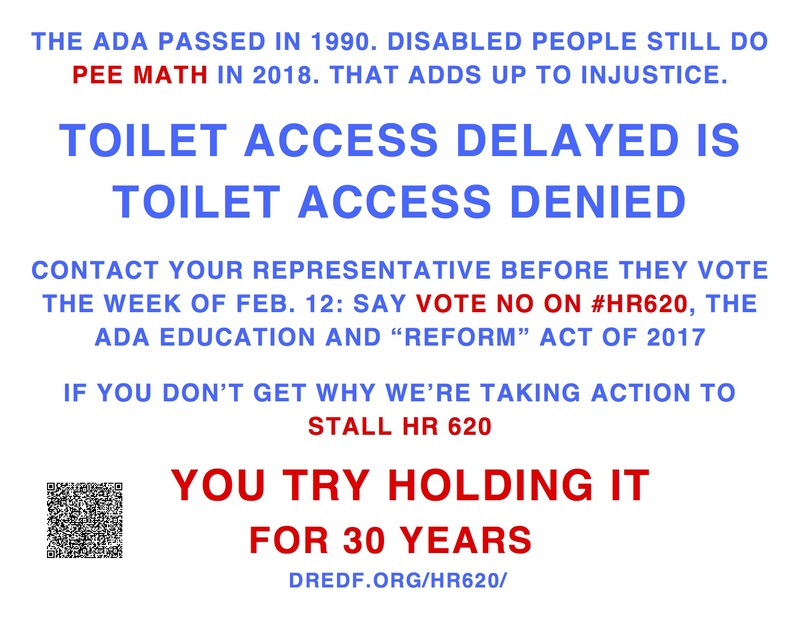 The ADA was passed not long after I graduated from college. I thought about what my life has been like for 30 years. Especially my work-life. I’ve had to introduce myself in professional settings and almost immediately go public on some toilet access problem. In my case, I was a young white woman having to tell an older white man, who I didn’t know, intimate details about my bathroom needs. Imagine adding a racial element to that scenario. I thought about the media advocacy training I flew 2,000 miles to in 2004, the one where I had prepped them re access and they forgot the only bathroom was down a long flight of stairs. While they talked oppression, I did #PeeMath. I thought about my first day on the job as a development and communications officer at a women’s rights advocacy organization where I had to have my boss take me to the bathroom and wait for me because it wasn’t accessible. I thought of being at a civil rights grantees’ convening in 2006 – and knowing I was the advocate who was denied a bathroom I could use because Marriott said my confirmed ADA room wasn’t *really* confirmed. I thought about the diversity exercises we did 1991-1994 — from a training manual called Todos — that didn’t mention people with disabilities, much less what it’s like to fight publicly to pee. I thought about the retreat I went to in 1996 as a prospective board member where I had to use the freight elevator and was supposed to raise my hand if I needed the bathroom.